Looks can be deceiving! Below are five fountain pen barrels and caps that certainly appear to be various forms of vintage pens. Before you glance down the page, try and guess what surprise awaits inside each….. The first “instrument” (from the top) is a Holy Water Sprinkler. Produced by an unknown maker, it has a gold (worn) cross on the side of the barrel and is a cheap button filler. Many of the major fountain pen manufacturers made this for priests to use during a mass, or to take with them when calling on the sick, or those not able to be at church. I have seen examples from Parker and Waterman, and read about a Leboeuf model as well. All of these are of higher quality than this “no- name” version, but any are highly collectible. Here is a close up of the end of the sprinkler. The Aspergillum measures 5 5/16 inches capped and 5 3/16 inches posted. The lack of a nib leads to the shorter capped measurement. The cross on this is simply a gold painted indentation to the barrel and has worn off. I plan on repainting it as soon as I can come up with the correct Testor’s match. The second instrument is a Duo Fast Stapler. Duo-Fast is a 70 year old Company, based in Illinois (USA), still specializing in all types of fastening processes and tools. These are relatively common and can be found on-line for low prices. I am not sure how practical they were, and if they had any mass use, but probably were a promotional item. Finding one with the correct staples is a plus, as most are without them. 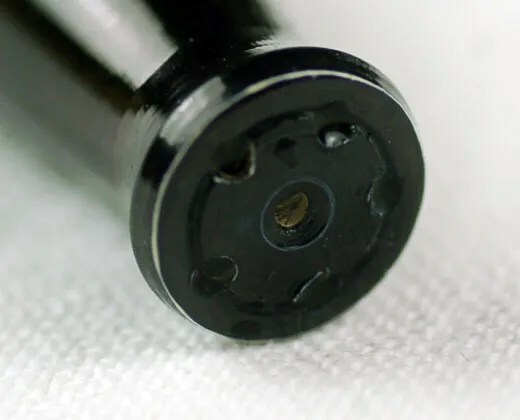 A closeup of the tarnished clip. The stapler measures 5 3/16 inches capped and the instrument does not post. The holder measures 4. 7/8 inches closed. The last two instruments are postal scales – in – a – pen. The first one, in black hard rubber, was produced by the Exact Weight Scale Company of Columbus, OH. There is an imprint on the cap end to this effect. The imprint on the side of the barrel suggests that it was made for the Atlas Novelty Company of Chicago and Pittsburgh. According to a web search, “The Smith Scale Co., manufacturer of the Exact Weight Scales, was “organized in 1916, for the purpose of making scales under the patents of Walter Standish Smith.” Smith later changed its name to Exact Weight Scale Co., was in Columbus, OH and was in business at least until 1973 as evidenced by patents assigned to the company”. Further research shows that the Company may have lasted longer than this and well into the late 8os, though in Canada. The scale, used for letters that would be clipped (the clip on this model is broken) to the end for weighing was produced in many variations – black/black (this one) – black/white – white/red – and later plastic models in white pearl (see below) and green marble. Years of production were probably in the 1935 to 1955 range, due to postal rates shown below. Most of the earlier variations included advertising or promotional messages similar to this one. 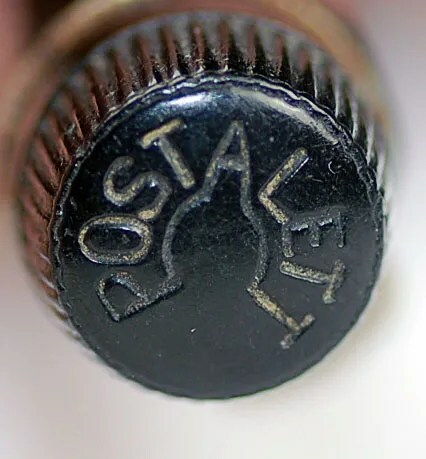 The end of the barrel has the instrument name – Postalett. A Patent Search shows that Patent No. 2,009,363 was issued to William Scheurer of the Exact Weight Scale Company in 1935. 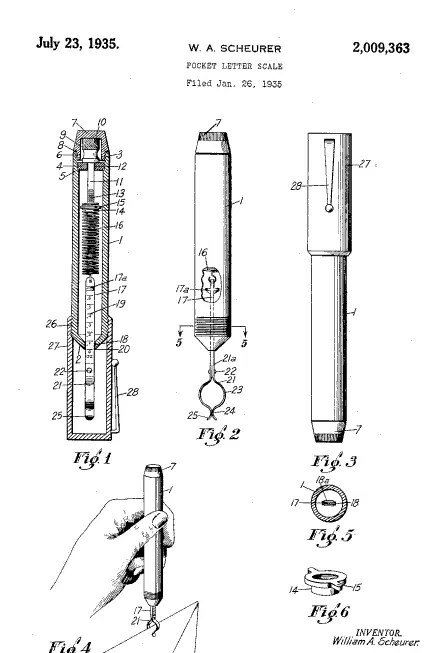 A full view of the patent can be found here. The scale itself, showing the 8 ounce limit for letters, and the rates for the time period. The last fountain pen look alike is also a postal scale, and I believe it is a later product, made by, or for, the same Company. The scales are the same as in the earlier all black model, as is the letter clip., but I am quite certain this is also a Exact Weight Scale Company Postalett. 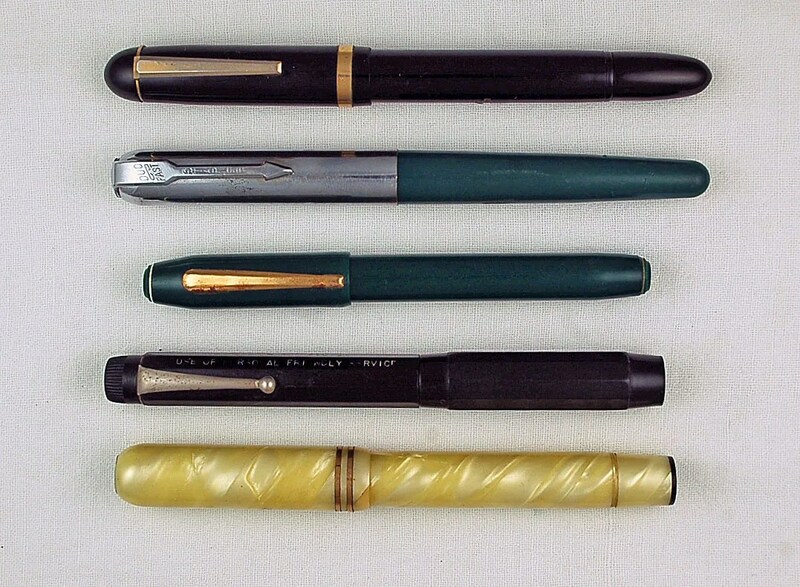 These are just a few of the many fountain pen look-a likes that were produced over time. Some novel, some useful, and some spiritual. All have fooled the collector when scouring an estate sale or antique store. I have a few more that I will clean up and ready for another article soon.